Universities in South Africa claim to use science and innovation to raise living standards for the rural poor. But how does science for society work in practice? Is it a linear process? A new journal article investigates the knowledge-production for societal-benefit missions of various universities. Artificial Intelligence (AI) may lead to massive job losses, according to some sections of the media. But could it not be a source of new jobs? A new working paper discusses the challenges of the AI arms race, and analyses its potential impact on jobs and equality. The migration of higher education students from North Africa has risen over the last few years. But from what countries, for what reasons, and with what impacts? A new working paper says countries of origin should address the push-pull factors to better mobilise students and their skills. These are just a few of the questions tackled by our researchers in March 2019 — in nine journal articles, seven working papers, and three PhD defences, among many others. Click here for the full list of our most recent publications. ‘Producing knowledge to raise rural living standards: How universities connect with resource-poor municipalities in South Africa‘ explores the extent to which South African universities partake in science and innovations designed to raise the living standards of poor rural residents. The article concentrates on how well universities have fulfilled their knowledge-production for societal benefit missions in practice, through a comparison of the performance of universities across three relevant initiatives. The findings suggest that the science-for-society value chain is non-linear, rather than a straight line as presumed by much of the existing research. By Dr. Alexis Habiyaremyee et al. ‘Brilliant technologies and brave entrepreneurs: A new narrative for African manufacturing‘ argues that the manufacturing sector still has an important role to play in Africa’s development. The article explains that despite failing to industrialise in the past, there may be a new window of opportunity, due to the convergence of what has been called ‘brilliant’ new technologies associated with the Fourth Industrial Revolution (4IR) and a resurgence of start-up entrepreneurship. In this light the author (i) shows why manufacturing is vital for African economies, (ii) critically analyses the nature and impact, both in terms of opportunities and risks, of the new technologies associated with the 4IR for Africa; (iii) describes the resurgence of technological start-up entrepreneurship in Africa and (iv) calls for policy support in the form of complimentary investments and regulations to allow entrepreneurs to utilise opportunities and to minimise threats. In short, it argues that a new narrative for African manufacturing is possible. By Prof. Wim Naudé. ‘Raising the achievement of immigrant students: Towards a multi-layered framework for enhanced student outcomes‘. This article aims to help policymakers juxtapose key characteristics of their immigrant students’ achievement against individual, family, school, community, and host society characteristics and policies. The discussion underscores the importance of connecting this multi-layered framework with other important sectors within governments such as those responsible for the economy, health, social protection, and immigration. Finally, the paper examines limitations with current large-scale data sets and the implications for research and policy analysis. By Prof. Louis Volante, Prof. Melissa Siegel et al. ‘Human rights, income and international migration’ addresses the question: why does international migration persist despite welfare improvements in migrant‐sending countries? The authors propose that the human rights condition of origin countries is an important determinant of global migration. Although the human rights issue is not new to researchers in migration studies, the concern is primarily about the rights of migrants, refugees, asylum seekers or migrant workers in a host country. The study finds that international migration is positively associated with human rights conditions and income. The results imply that efforts to promote human rights may also be assessed in relation to their contribution to migration flows. By Dr. Pui-hang Wong and Dr. Mehmet Guney Celbis. ‘Dynamics of product complexity in Africa: Structural estimation using structuralists model‘ shows how African nations are still diversifying their outputs towards the ubiquitous (fewer complexes) products. The paper presents a significant and positive relationship between economic complexity index of Africa and the time derivative of the economic complexity index of Africa (the explained variable). This implies that “weak” effort African nations exerted so far in diversifying their outputs towards the less ubiquitous commodities and absence of “automatic catch up tendency” (unlike what is presupposed by the mainstream neo-classical growth models). By Bogdan Dima and Miruna Nachescu. ‘”This conflict has turned me into a doctor, nurse and nutritionist at the same time”: How peer support among HIV-positive IDPs created opportunities for care in conflict-stricken Kabaré’ investigates the role of indigenous social relations in the promotion of care among IDPs living with human immunodeficiency virus (HIV) in a conflict region known as Kabaré in the south Kivu province of Eastern Democratic Republic of the Congo. The article shows that despite having some limitations, peer support was crucial in providing much needed empathetic social, economic, psychological, material, nutritional and emotional supportive services to HIV-positive IDPs. By Dr. Choolwe Muzyamba. ‘Rural innovation adoption pitfalls: The case of interrupted diffusion of sericulture among Rwandan farmers‘ studies how the government of Rwanda has sought to harness sericulture (production of silk and rearing of silkworms for this purpose) as a potential rural innovation that can create new employment opportunities and help poor farmers generate higher incomes. By Dr. Alexis Habiyaremye. ‘Knowledge exchange and innovation co-creation in Living Labs projects in South Africa‘ explores how the co-learning methodology, inherent in the Living Labs approach, has been deployed to stimulate knowledge exchange and absorption in marginalised rural communities in South Africa and empower them to participate in the innovation process. This paper uses three examples of successful innovation co-creation to illustrate how transformative change can be achieved through co-learning between living labs researchers and user communities. The corresponding experiences of knowledge-co-creation in South African Living Labs highlight the role of government support for capacity building in the co-learning approach targeted to inclusive transformation of the livelihoods of marginalised communities. By Dr. Alexis Habiyaremye. ‘Regional integration and knowledge flows: Effect on manufacturing productivity in Southern Africa‘ illustrates why geographic proximity is important for technological learning by facilitating direct interactions and knowledge diffusion. Thanks to its impressive diamond deposits and its geographical proximity with the South African economy, Botswana is well poised to benefit from mastering and applying technologies that already exist in its southern neighbour. Botswana’s geographic and economic proximity with South Africa is one of its most important winning cards for a successful technological catch-up and long term-growth. By Dr. Alexis Habiyaremyee. ‘The race against the robots and the fallacy of the giant cheesecake: Immediate and imagined impacts of artificial intelligence‘ describes the nature and context of the concerns that artificial intelligence will disrupt society. The paper reviews the current state of the empirical and theoretical literature in economics on the impact of AI on jobs and inequality, and discusses the challenge of AI arms races. It concludes that despite the media hype neither massive jobs losses nor a ‘singularity’ are imminent. 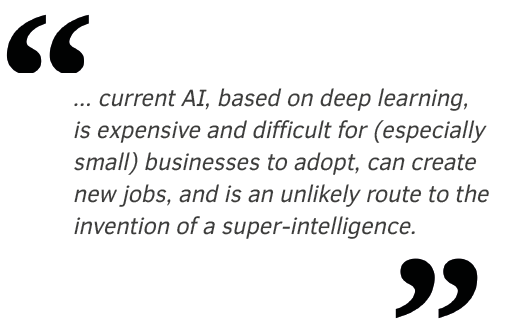 In part, this is because current AI, based on deep learning, is expensive and difficult for (especially small) businesses to adopt, can create new jobs, and is an unlikely route to the invention of a super-intelligence. By Prof. Wim Naudé. ‘The middle-technology trap: The case of the automotive industry in Turkey’ argues that Turkey has fallen into a middle-technology trap on the borders of a weak innovation system (IS) and strong global value chains (GVCs). The analysis at the project, firm, and expert levels indicates that despite extensive upgrading and learning in manufacturing, the automotive industry has failed to build innovation capabilities. Turkey’s delegated role in the automotive GVC, the joint venture (JV) structure and the lack of complementarities collectively work in creating a trap that impedes further technological development. By Dr. Semih Akçomak et al. ‘Patterns of migration in the European Union’ aims to map the patterns and dynamics of migration within the EU of individuals of EU28 origin as well as those from outside the region. The descriptive analysis is based on existing data, largely drawn from Eurostat’s online database on population statistics. One of the key findings is that, when analysing migration trends, metrics matter, as different metrics often tell different stories. The authors also find that focusing on stock data alone tends to give an incomplete picture of the patterns and dynamics of intra-EU migration. By Dr. Katrin Marchand, Veronika Fajth, Zachary Strain, Dr. Clotilde Mahé and Prof. Melissa Siegel. ‘Migration of higher education students from the North Africa region‘. The findings of this paper support four hypotheses: first, that from a national perspective, the pattern and size of migration of higher education students from the North Africa region increased substantially over the past years but the distribution showed considerable variation across countries; second, that the increasing trend of migration of higher education students from the North Africa region is caused by several push-pull factors (e.g. economic, social, political, cultural and educational); third, that migration of higher education students from the North Africa region leads to mixed positive and negative impacts (e.g. transfer of knowledge, brain gain and skill acquisition for returned migrant students, but weak capacity to retain talents and brain drain for non-returned migrant students); fourth, that the skills of migrant higher education students from the North Africa region can be better mobilised in their countries of origin by addressing the push-pull factors that determine migration of skills from the North Africa region. By Dr. Samia Nour. ‘Knowledge economy and economic development in the Arab region‘. This study shows a positive relationship between income level and all knowledge economy index pillars (economic incentive and institutional regime pillar, education and human resources pillar, the innovation system pillar, and information and communication technology (ICT) pillar) and all factors facilitating the promotion of knowledge economy including institutions, human capital and research, education, tertiary education, research & development (R&D), infrastructure, information and communication technologies, and innovation. The paper suggests that the promotion of knowledge economy depends on promotion of institutions, economic incentive and institutional regime, education, human resources and research (human capital, education, tertiary education, research & development (R&D)), innovation system (innovation input, output and efficiency) infrastructure, and information and communication technologies. By Dr. Samia Nour. ‘Health insurance and self-employment transitions in Vietnam‘ examines the relationship between health insurance and self-employment in Vietnam with a focus on the comparison between the voluntary scheme for the informal sector (mostly self-employed workers) and the compulsory insurance for the formal sector (mostly wage workers). The paper shows that those with compulsory health insurance in Vietnam, the formal workers, are 10 percentage points less likely to enter self-employment compared to those having voluntary insurance. Regarding self-employment exit, people with compulsory insurance are more likely to exit self-employment compared to those covered by voluntary insurance. However, the effect size is relatively small. By PhD fellow Nga Le, Prof. Wim Groot, Dr. Sonila Tomini et al. ‘The impact of a mathematics computer-assisted learning platform on students’ mathematics test scores’ aims to identify the effect of the use of an online adaptive learning tool for mathematics: The Mathematics Adaptive Platform (PAM) on the test score gain in mathematics based on longitudinal data from a sample of students in primary education in Uruguay. The results show a positive effect of 0.2 standard deviations on mathematics test scores. Results also show that the impact of PAM increases as the socioeconomic status of students decreases. There is no heterogeneous impact by gender. This is the first evidence at a country‐wide level of the impact of a pedagogical tool of this type. By Marcelo Perera and Diego Aboal. ‘Essays on the impacts of climate-smart agricultural innovations on household welfare’ investigates the decisions agricultural households make in land and crop management, crop portfolio choices and post-harvest storage to cope with the risks they encounter and improve their livelihood. Principally, it provides empirical evidence about the impacts of three climate-smart land and crop management innovations: conservation agriculture, crop diversification, and crop storage technologies on household welfare and risk coping using survey and historical weather data from Ethiopia and Uganda. The findings make important contributions to the literature and provide relevant policy recommendations that could assist rural households on their path to development. By Dr. Wondimagegn Tesfaye. ‘Aggregate fluctuations and development: Essays on macroeconomic volatility and economic growth’ assembles a number of studies concerned with the analysis of developing-country macroeconomic volatility, both from consumption and output perspectives. This dissertation contributes to fragments of larger questions and addresses different aspects of the development puzzle in two parts. Part I is a collection of two essays focusing on the empirics of business cycles inherent to consumption series. Part II consists of two essays on the empirics of growth volatility and the theoretical aspects of stochastic shocks on the steady-state economic growth and on the balanced growth path’s speed of convergence. By Dr. Ibrahima Kaba.